Anableps are livebearers, and males have a gonopodium. Males and females are either "Right handed" or "Left handed", in that a male with a gonopodium to the left can only mate with a left female, and right male can only mate with a right female. These fish, despite their size, can be easily frightened and are best in a species tank in groups of their own kind. Primarily insectivores, will gladly take brine shrimp, bloodworm, wingless fruit flies and shrimp. Feed once or twice a day, will only really feed from the surface. 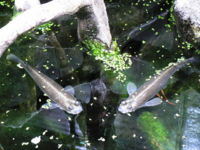 These fish are essentially brackish fish, they can spend a short time in freshwater, but won't do well for long. In the wild they're found in rivers and estuaries, and will spend some time in the open ocean also. They are very capable jumpers and purely top dwelling, so a secure lid is a must. They also need some current and will spend time near the outflow letting the water wash over their gills. The tank should have a large surface area, depth is not important. The Four-Eyed Fish is very aware of the goings on outside of the tank and can be easily frightened by sudden movements, and even bright colours. When scared they will go to the bottom of the tank, into a corner, and turn a dark grey-black. This colour change can also indicate problems with the water, which they are sensitive to. They're also prone to bacterial infections and water quality must be kept good. These fish get their name from swimming just below the surface of the water with only their eyeballs half-breaking the surface, giving the impression they have four eyes, two above the water and two below! They have a dorsal retina and a ventral retina.